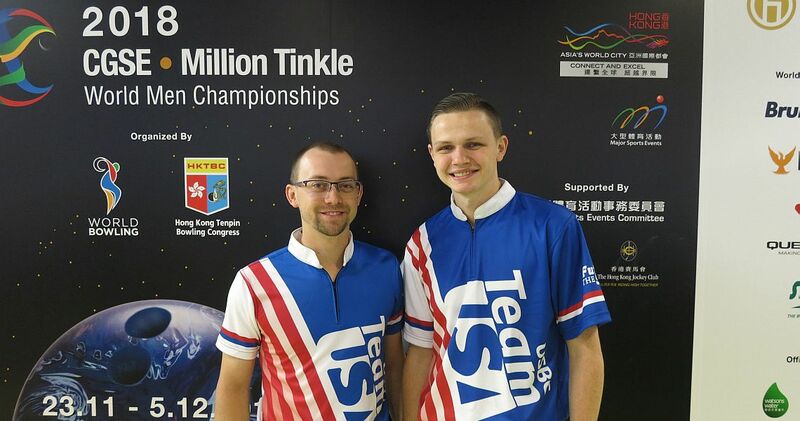 Some of the biggest names in tenpin bowling moved to the top of the leaderboard in the Doubles preliminaries at the 2018 CGSE • Million Tinkle World Men Championships in Hong Kong, China, during squad 3 Wednesday. EJ Tackett and Andrew Anderson from the United States, who earned PBA Player of the Year honors in 2016 and 2018, respectively, played in their own league averaging almost 230 as a team on the challenging lane condition at SCAA bowling center as they took the lead with 2756 six-game total and an average of 229.67. 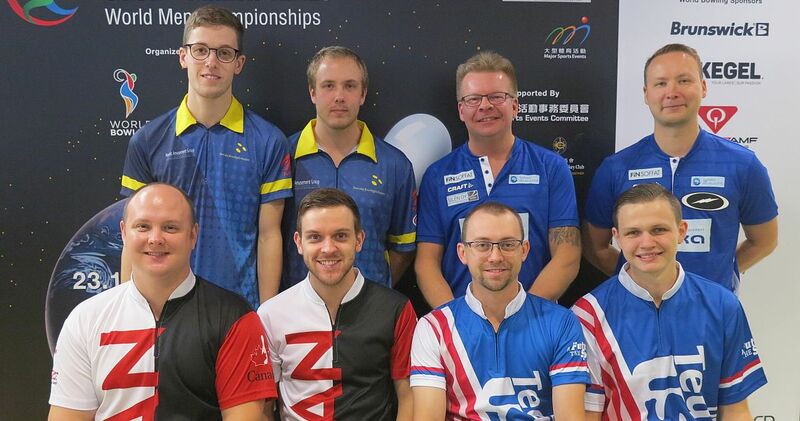 Featured photo: The top 4 of Squad 3 from front right, clockwise: Anderson & Tackett (USA), Lavoie & MacLelland (CAN), Andersson & Jansson (SWE) and Lehtonen and Ratia (FIN). 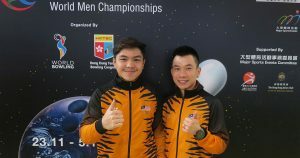 Making their first appearance at a World Bowling World Championships, the PBA champions posted games of 458, 449, 531, 443, 449 and 426. 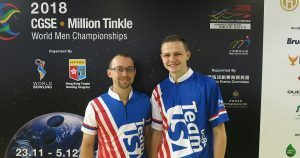 Tackett, 26, led the way with 1421 (236.83), including high games of 289 and 257, and Anderson (right, l-r), 23, who posted the first 300 game of this Championships on his way to earning the top seed for the Singles finals three days ago, added 1335. 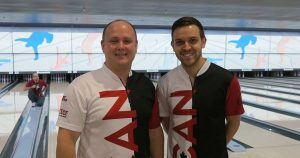 Trailing the Americans by 90 pins to take second place were Dan MacLelland and Francois Lavoie (left, l-r) of Canada, who won the gold medal in Doubles at the X World Games 2017 in Wroclaw, Poland. MacLelland, World Champion in Singles in Abu Dhabi, UAE, 2014, started the day with a 299 game (7-pin) on his way to a 1375 series, while Lavoie, the 2017 World Bowling Championships Masters gold medalist, contributed 1291 for 2666 total (222.17 avg.). Overnight leaders Adrian Ang and Tun Hakim (above, r-l) of Malaysia slipped to third place with 2596 (216.33). 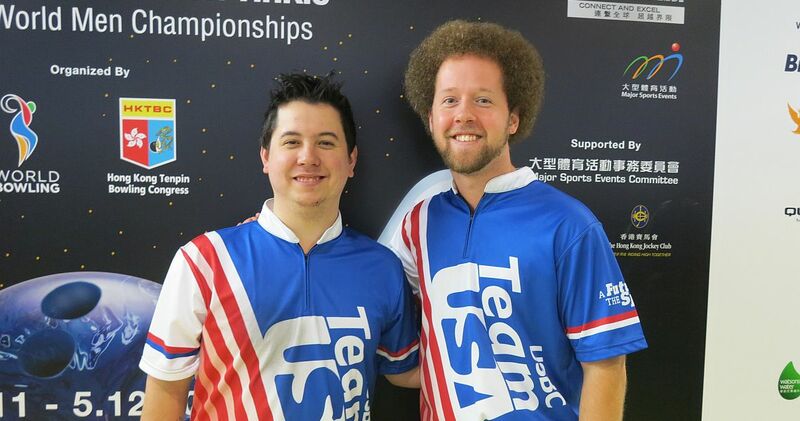 With the teams of Squad 4 having yet to bowl their six-game blocks, Squad 1 leaders Jakob Butturff and Kyle Troup (left, l-r), USA, hold the fourth and last place to advance to the medal round with 2549 (212.42). If they would hold on they would meet their teammates Tackett and Anderson in the semi-finals. 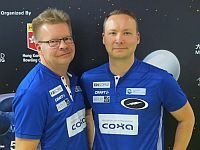 Heading into the last game, Kimmo Lehtonen and Jari Ratia (right, l-r) of Finland and Markus Jansson and Pontus Andersson of Sweden were in a position to make the top 4. Needing 408 to overtake Butturff & Troup by one pin, the Finns finished with 387 to fall 20 pins short in fifth place with 2529 (210.75). 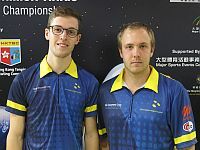 The Swedes (left), who won the gold medal in Doubles at the 2014 World Youth Championships here at the SCAA bowling center in Hong Kong, needed a final 426 game to overtake the U.S. team, but managed only 371 to land in eighth place with 2495 (207.92). Colombia’s Jaime Gonzalez and Santiago Mejia (2512, 209.33) and Germany’s Fabian Kloos and Timo Schröder (2504, 208.67) slipped out of the top to sixth and seventh place, respectively. 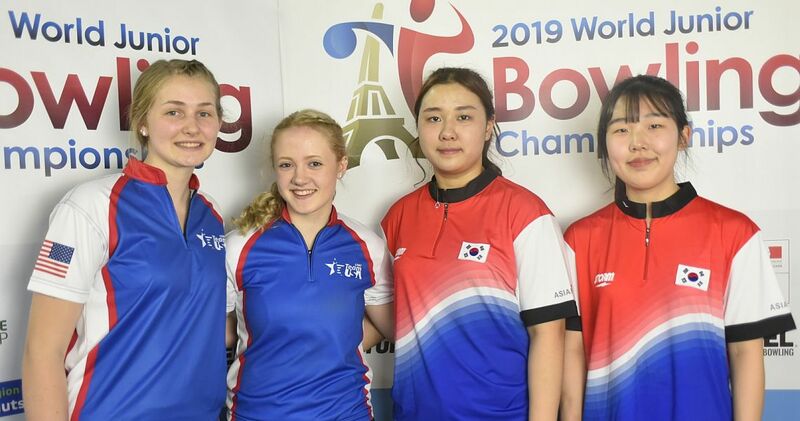 The bowlers of squad 4 will conclude the Doubles preliminaries starting at 13.45 p.m. Hong Kong time. 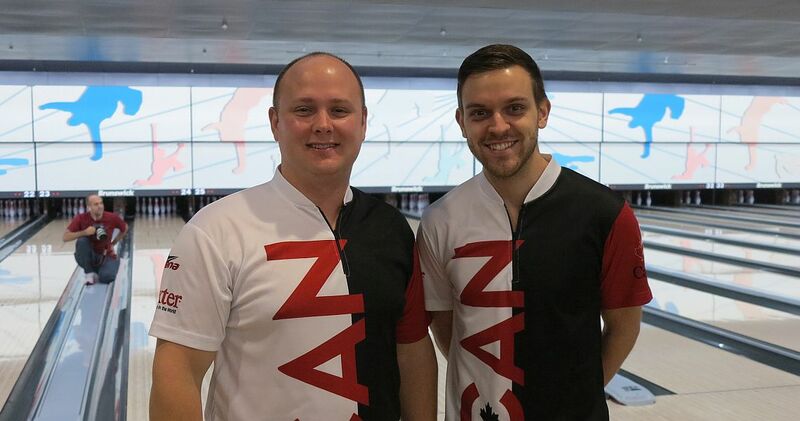 With 201 out of 265 players having completed 12 games, Andrew Anderson (right) leads in all-events (total pinfall in singles, doubles, trios and team preliminaries) with 2808 total and an average of 234.00. 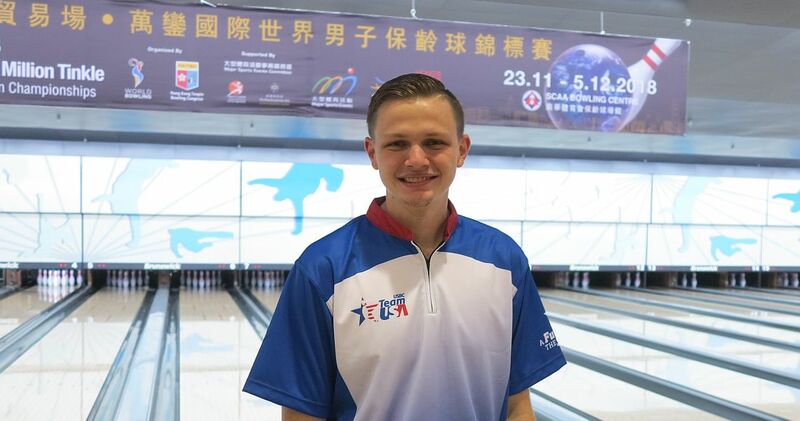 Dan MacLelland moved into second place with 2724, while Kyle Troup slipped one spot to third place with 2714. 300 games (1) – Fabian Kloos. 300 games (2) – Andrew Anderson, Fabian Kloos.